This year, we celebrated Big Buddy's 4th birthday with 2 parties - one at home for family and relations and a second one at school with his friends. 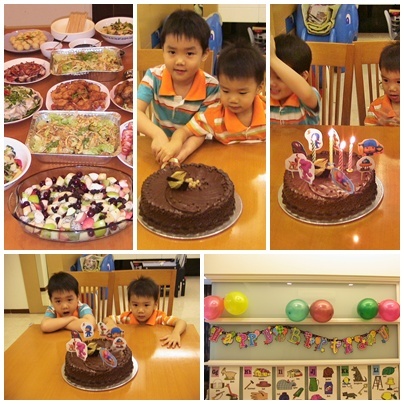 The home party was celebrated the weekend before his birthday. My mother and her helper did all the cooking and wow, what a sumptuous spread it was! We had prawn fritters, ngoh hiang, sotong youtiao, char siew, roasted pork, fishballs, mixed vegetables, fried noodles, chicken wings. For dessert, there was fruit salad and tau suan. And of course, we had a Pocoyo birthday cake, a design requested by Big Buddy. On the day of Big Buddy's birthday, he woke up nice and early. And for once, we did not have to hurry him to finish his breakfast and dress for school. He was all ready to go, dressed in his party clothes. 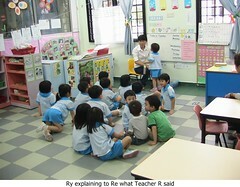 He had a wonderful time in school that day, sharing his birthday joy with his friends and teachers. Little Buddy came along to the party too and Big Buddy was so well-behaved and considerate towards his brother that it caught us by surprise. And that night, we had another smaller birthday cake for him, courtesy of someone who blessed him with it. So all in all, he had 3 cakes for his 4th birthday!